Approved for Title 1, RTI, small group instructions and correlated to the Core Standards. Most importantly, motivational for students. 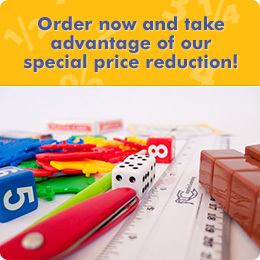 Camelot Learning’s Math Intervention Curriculum for students in grades pre-K through 9 provides a skill-based, manipulative-rich “non-computer” learning environment. The research-based curriculum is designed to help students, especially reluctant learners improve their math skills. In fact, Camelot students perform 30% better than peers on standardized tests. Our patented lesson plans are correlated to Core Standards and NCTM Standards, and can be used during the school day, after school or in summer learning programs. To minimize teacher preparation time, Camelot Learning provides everything you need. Each curriculum theme includes scripted 40-minute lesson plans, student workbooks and manipulatives for each student. So teachers spend less time planning and more time engaging students with effective teaching strategies, games and hands-on learning. Building a solid math foundation is motivational for students, who experience success in every Camelot Learning lesson. Incorporating RTI’s continuous progress monitoring with formative and standards based assessments built into each lesson, Camelot Learning Math Intervention maximizes student success. Teacher Kit includes a Teacher Guide with scripted lesson plans and answer keys, Student Workbook, Student Appendix (game boards and game cards), vocabulary flash cards and score cards for daily lessons in a laminated binder, as well as all manipulatives and teaching aides.